Pretty pink fortune cookie the size of the palm of your hand, comes individually wrapped and tucked inside a matching pink Chinese take-out box. Your custom fortune cookie message inside! It’s bigger than a traditional sized cookie but smaller than our giant-sized ones, yet still bursting with gourmet flavor and style. It fits nicely in your hand and sports an oversize fortune for longer messages. We love how it tucks perfectly into a pretty pink Chinese takeout box, and then into a white shipping box. Now through October 2014 we're even including ground shipping for our Junior Giant, all for just $12.97. 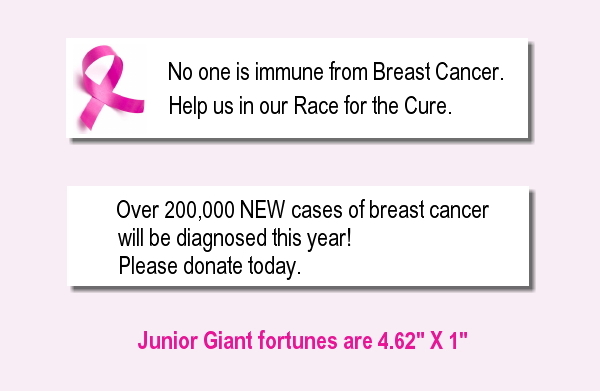 More and more we’re seeing corporate clients support the mission of Breast Cancer Awareness during October—and beyond. They’ve discovered that identifying themselves with such a worthy cause reveals a more human side to their company and displays their social conscience. We feel the same way, which is why we donate 10% of the proceeds from our Fortune Cookies For A Cure to the Breast Cancer Research Foundation. And while this is certainly a serious subject, we’ve heard from our customers that our pink ribbon fortune cookies filled with inspirational messages were just the thing to lift spirits at their event.